Feeding time can be fun! 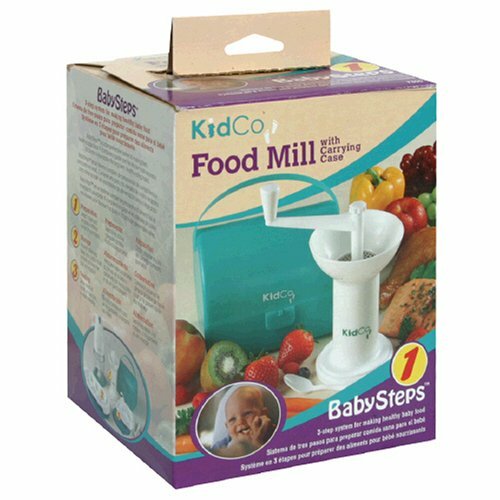 The KidCo Food Mill and Tote allows the parent to make their own baby food. No more going to the grocery store and buying canned baby food. The Food Mill and Tote by KidCo allows the parent to buy fresh vegatables and make their own baby food. The Food Mill strains, purees, separates seeds, bone and skin. A great feature is that it requires no batteries or electricity. The KidCo Food Mill and Tote allows the parent to give their child the healthy food choice that they need. When you get the advice from your doctor "feed him what you're eating" around the 9-month mark, you puzzle over how to do this for a while. If you're like my husband and I (total foodies) you may be intimidated by pureeing everything you carefully craft into nothingness in the blender. Well, worry no more - even if you're not a foodie! This little gadget is awesome! We use it at home 1-2 times a day and take it with us every time we eat out (the carrying case contains the messy parts until you reach home.) So as not to offend baby's delicate palate I usually order some lower spiced items off a menu and try to make healthier choices for him (like baby carrots, mashed potatoes, and grilled rosemary chicken). This is so easy to do a-la-carte. You just pop the food into the middle part of the mill, put the top on and push down and turn at the same time. Viola! Finer than mashing with a fork, but not as smoothie-like as a blender. In fact, my baby now prefers the texture this creates to the blender. I have put everything from a mild vegetable curry (chickpeas for protein) to homemade beef stew to a beef enchilada from our favorite authentic Mexican place through this wonder and it does a perfect job every time. Things that are too difficult to grind end up in a little disc in the bottom of the mill - we just give that to our dog if it is something he can have. If you take an extra minute and grind up a second serving while you already have the mill out, you can freeze it or put it in the fridge for a backup meal for when you are eating something inappropriate for baby or just having leftovers. I purchased the Food Mill to make baby food preparation for my grandson a bit easier. While still preparing the majority of baby food using the larger food processor & freezing portions, my daughter loves the Food Mill for quick meals on the go or to share some of her meal. The consistency of the food is perfect for an infant & the grinder quickly provides the amount needed for a hungry baby. Two suggestions: 1. Keep a large plastic bag in the carry case for easier clean up after you get home. 2. Be sure to lock the grinder wheel/handle into the base to prevent chunks while grinding food. Only grind in a clock-wise direction. It's very easy to unlock. Made life so much easier! Gets the job done for really soft foods. 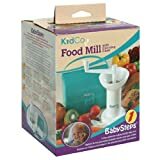 Kidco food mill gets the job done if you are using really soft foods. I was excited to find a food mill that was small, seemed easy to use, and was a good price. I didn't hesitate to buy it despite some of the bad reviews it received here on amazon. I just bought this the other day at Babies R Us and it was around $12. It has a plastic grater that it, or should I say YOU push the food through and a surgical steel blade that it used to move the food through the plastic grate. I first used it on peas and carrots. The peas milled up just fine but the carrots didn't even make it though. The carrots weren't over cooked, I'd rather not over cook vegetables for my son to help retain most of the nutrients. So the carrots were a bust. The peas milled up well but were the consistency of mushy rice, and in no way compared to a stage 2 baby food as some reviews have stated. It was much lumpier. Maybe if the peas were well done it may have been smoother. There again I run in to nutrition retention. If your food is very overcooked anyway, then it's probably just as easy to mush it yourself. It's very easy to load the food into. Be sure it's well drained or it can leak. It's easily cleaned just pull it apart and wash or run in the dishwasher. It was probably a great idea overall, but I did not find any use for it. When you go out to eat - you have enough stuff to carry with you so the jares were just fine. At home I'd just use the food processor - easier and faster. Was so happy I found this!!! This is my first baby food mill and I found it to be very easy to use and clean. My 1 yr old loves the new flavors that I am able to offer since he has been eating only packaged baby food. I also use the mill to grind up veggies to add to food I prepare for my 3 yr old boy, who does not like to eat green leaf veggies primarily because they are tough to chew. The mill allows me to increase his veggie intake without much fuss. The food mill is very handy. I didn't bother using it with my first two kids (I'd received one as a hand-me-down from a friend). It seemed to be too much hassle. In fact, it's really simple. I use it daily with my third child and wish I'd experimented with it a few years ago. Our pediatrician encourages us to give our child what we eat, not to depend on Gerber or Beech Nut too much. The problem is that it's difficult to mash (with a spoon or fork) foods like banana, avocado, potato, small curd cottage cheese and other soft foods to the consistency that my child will eat (super smooth). This food grinder does that for you. It is really easy to clean and simple to tote around. I'll even mill several foods during one sitting, cleaning it between food types - it's that easy to take apart, clean and reassemble. In response to other reviews on this site, you can put cooked chicken into it, or crisp apple, but these won't become as smooth as yogurt. For that, you'd have to add water to the chicken, possibly add some other blending agent like potato, and use an electric blender. For apple or carrots, you'd need to cook it before you could put it into the mill and it would become smooth (like applesauce). Milling foods like corn and peas will probably result in some residual solid bits (the skin of the pea or kernel). To completely rid the food of that, you'd have to use a seive; even an electric blender would yield some solid bits. Works fine. Just a little cumbersom. I find using it at Grandma's and my friends, sometimes. I make large batches in my food processor, or just smash up the food with my fork. In a second hand shop 33 years ago I found a baby food mill. I had a blender and had been trying to make food for my baby that I cooked myself, but it was hard to insure that all foods were lump free. This little baby food mill was the answer to my prayers. My daughter-in-law was given a baby food mill as a shower gift over 5 years ago, so I knew the wonderful little gadget was still around and I knew I wanted my daughter to have one. My daughter has the one I bought and her baby is getting the best baby food perfectly pureed. Even though the blade is steel it took way too much work to get this food mill to mash up food. I put in some apple pieces and had to stand up at the table and push down with all my might while turning the handle to get the mill to work. Even then, it did a very poor job of grinding AND juice from the fruit leaked out the bottom of the mill. We also tried with bananas and got the same result. The plastic construction also gives it a flimsy and unstable feeling. Once, when pushing down while grinding, the whole thing slipped and tipped over. I am a mother of 4. My oldest is now 23 years old. I used this grinder with all four children and continue to give it as a gift to friends and family who are expecting. I used to carry it with me in my diaper bag... it was a great way to slowly introduce my babies to table food... and since we eat very healthy I knew what they were consuming. In addition, the fact that there are no cords or batteries meant you were never caught off guard with out an outlet or dead cells. This is a must. When I become a grandmother this will be one of the first additions to the cupboard of my children. I still have mine that is at least 20 years old and works like a charm. Works great for herbs and garlic as well. This product is fabulous. I used one like this 27 years ago with my first and then later with my 2nd child. They never ate baby food from a jar. I ordered two earlier this summer, for two baby showers. No problem. This last one.....took FOREVER to arrive. The seller did not communicate with me very well. They sent me a notice that there were all sold out.....4 weeks after the order was placed. And it finally arrived....unannounced! Happy to have the product, but wary of the seller. I will definitely look for someone else to buy this from in the future. My husband and I were first introduced to this baby food grinder about six years ago. We were at our friends' house, and they pulled it out, filled it with some veggies and rice from the dinner table, and had baby food in seconds! Their baby loved it. We can't imagine not having one now. The mill is handy, especially when out at a restaurant. We don't have the tote, but we keep ours in a plastic baggie. After using it, we just pop it back into the baggie and wash it at home (which is a breeze). This food mill is very easy to use and clean. I have found that a food processor works better for making food in bulk, but this does the job for small meals and dining out.